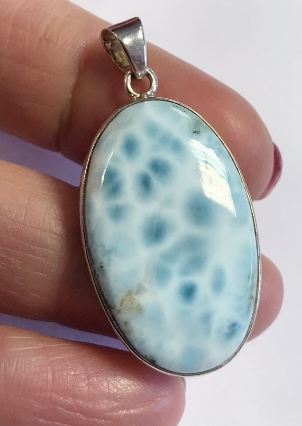 Set in 925 Sterling Silver, this Larimar pendant has a comforting energy. Larimar is one of the rarer stones today, as it comes from one mine in the Bahamas' Dominican Republic. Its beautiful blue and white, fluid colour looks like a pool of clear water on a sunny day. It brings an associated calm, tenderness, restful state that opening the mind to meditation, spiritual thought, and the will to fluid boundaries and possibilities.